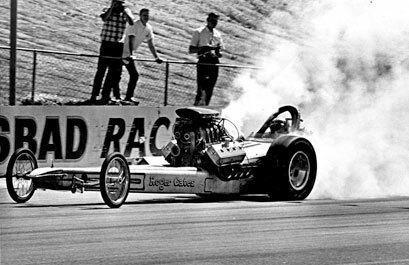 During the time Gates had the car it ran engine combinations of Chrysler (gas & fuel), Big Block Chevy (gas-alcohol-fuel) and 2 Big Block Chevies (2 races on gas). 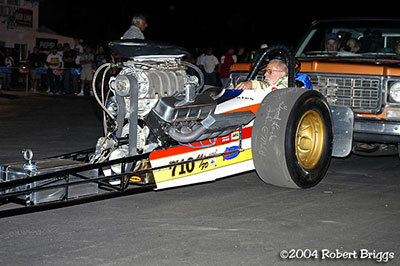 It ran mostly in southern California: San Fernando, Long Beach, Orange Co. Palmdale, Santa Maria, Irwindale, Carlsbad, Famoso, Ventura, Riverside, Raisin City and in Las Vegas, Phoenix, Tucson and Fremont. 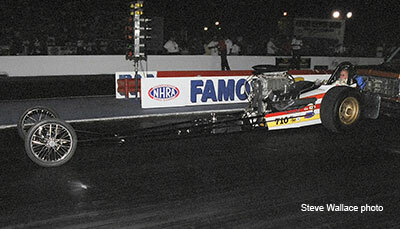 The car had a total of 26 event wins in both gas and fuel classes at NHRA, AHRA, UDRA, and independent Tracks with a best speed of 223 mph at 6:42 ET. 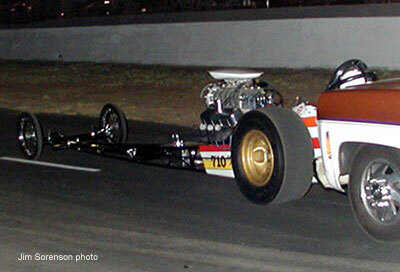 After the 1972 season the car gave way to the Rear Motor cars and Gates had started driving for other people (Tom Larkin, Craklin' Rose & Howard Cam Special). 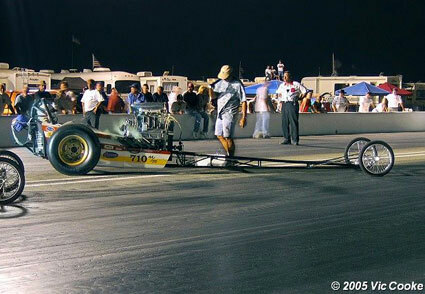 This car was eventually given to Donny Johansen (Howard Cams) by Roger and fell off the radar until 2001 when it was discovered by the Fenstermakers in Murrieta, CA sitting on a trailer beside an automotive shop owned by Jack McGrath. 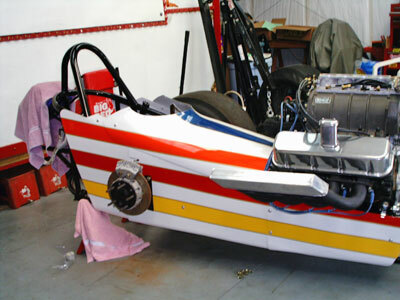 The following pictures are the transformation of this race car from full body, Top Gas to short body, Top Fuel over the six year period it was raced by Roger. 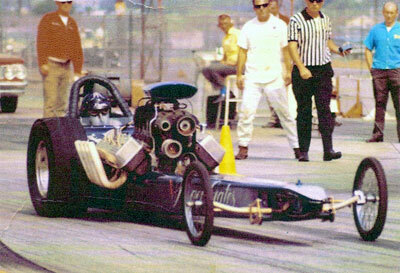 Gates at Carlsbad in 1966. 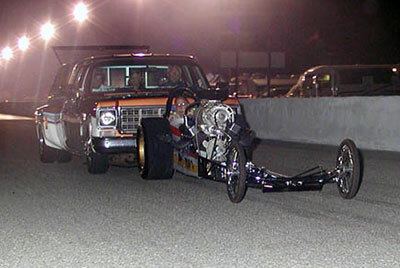 This was the end of the Chrysler era for the car. 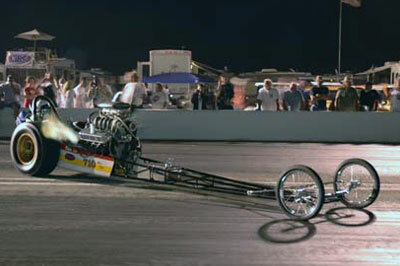 After this race the car was lengthened, changed to a conventional front end and fitted with the big block Chevy engine. 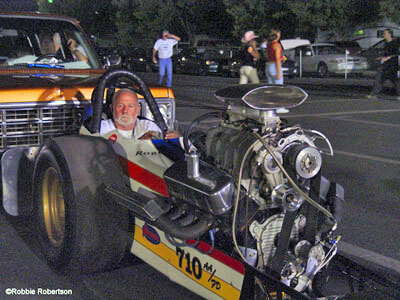 Since the 427 is wider and the motor had to be raised anyway due to the drive shaft angle change when the open tube rear end was removed and replaced with a Chrysler full floater it was all done at once. 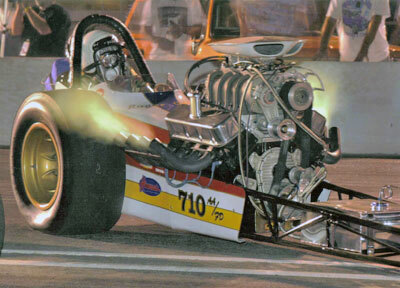 The open tube (Halibrand) rear end has the axle on the same centerline as the pinion and the Chrysler is 1 1/2" lower on the pinion. 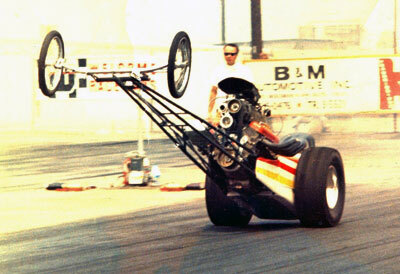 The reason that it had to all be changed is so the engine attitude would be correct. This was the end of the "Lizard" & the beginning of the "Rat". 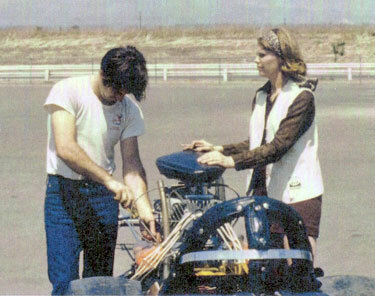 Roger and Virginia Gates getting car ready for a pass circa 1968. 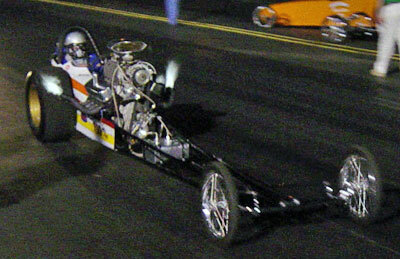 The car in its 1970 trim. 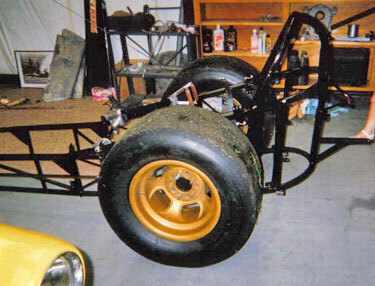 One of the many wheel stands that necessitated numerous chassis repairs. 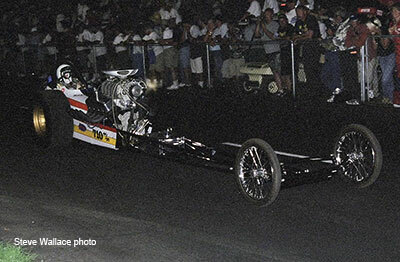 On this one the car was patched together with duct tape and a 2"x4" (Grade 'A' lumber of course) and finished the night runner-up. Fenstermaker purchased the car in late 2001 and took it to his family home in Georgia. While dismantling the car they found the SEMA tag under layers of paint. 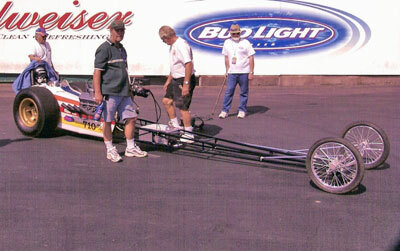 With some help from Don Ewald at WDIFL.com, they were able to trace the car back to Roger Gates. 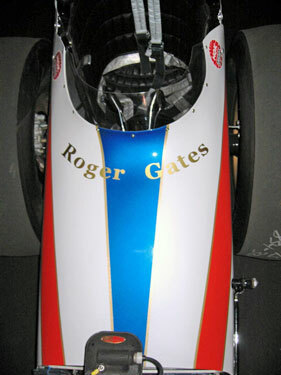 Dennis looked up his name on the computer and up popped 4-5 Roger Gates in California. He picked one and called - and sure enough it was the right Roger Gates. 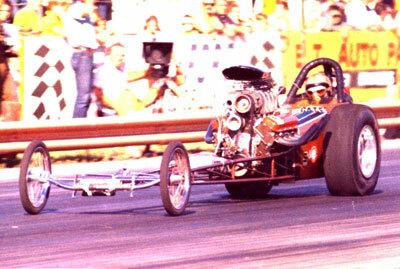 After a lot of pictures were sent back and forth, Gates identified the car as the first one he built for himself. Although it had been changed many times from the original form. 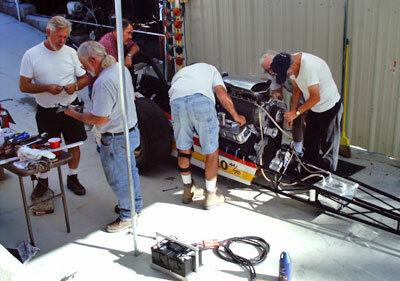 It was then they decided to restore the car as it ran in 1970. 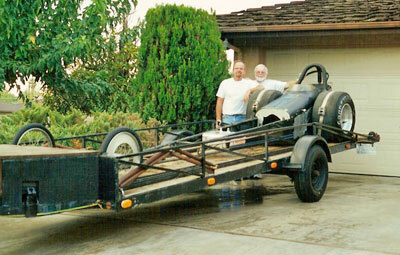 Fenstermaker came back from Vietnam in 1970 and he wanted to restore this car in this period for 2 reasons. 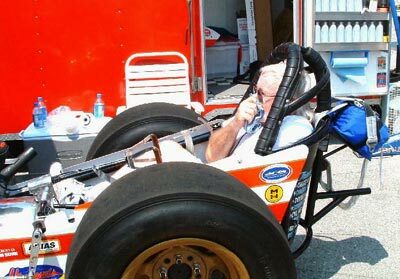 One was to preserve its history and to thank all the racers who gave him memories of exciting races while growing up in Southern California. The other reason is in memory of all the guys that didn't make it home from Nam as he did. It was a chance he was given to fulfill a dream of theirs and his own. 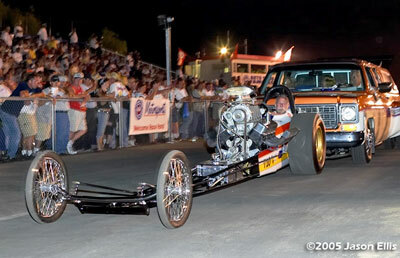 After almost two years they finished the car and took it to the 2003 California Hot Rod Reunion. We had a lot of help and encouragement along the way from family, friends, Roger Gates, Del Doss, Brendan Murry, and many others. Fenstermakers reward was the look on Roger's and Del's faces after their first Cacklefest. 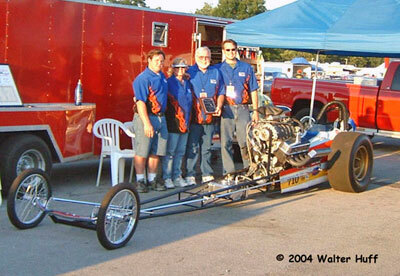 To bring back so many good memories to two people that have devoted so much time to drag racing and now teach young kids the art of drag racing in Jr. Dragsters - the future drivers, owners and crews of the sport. For Fensternamker the whole experience has basically been one giant payback. He was mostly a spectator while growing up, so giving back to the guys that gave so much to him was only natural but by doing this he has received more in return than anyone can imagine. He has met many new people and made a ton of new friends. 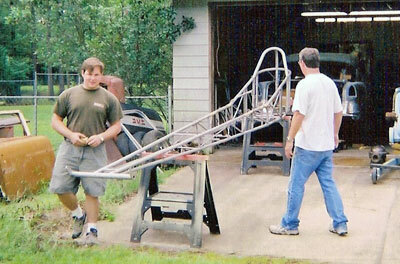 After completely stripping the chassis, Cody Fenstermaker and Mark Adams prep it for painting. 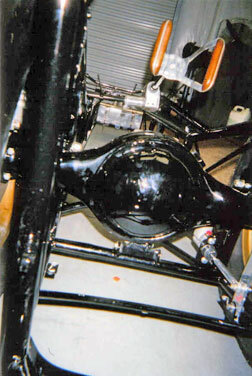 An early Chrysler rear end and Airheart brakes were installed in the freshly painted frame. Early Chrysler rear end, along with steering box and butterfly steering wheel. 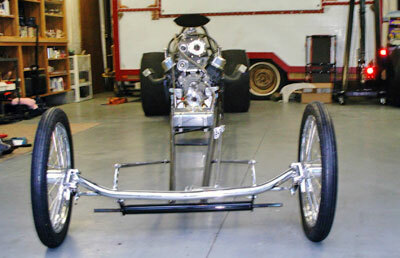 Early 16 inch Halibrand wheels with M&H slicks (old style) are added. 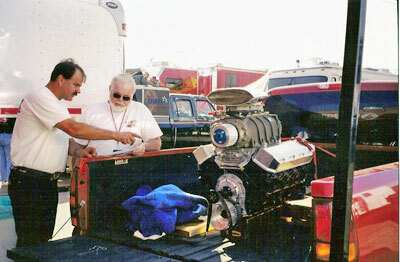 Power for this restoration came from Brendan Murry and his racecarparts.com business. 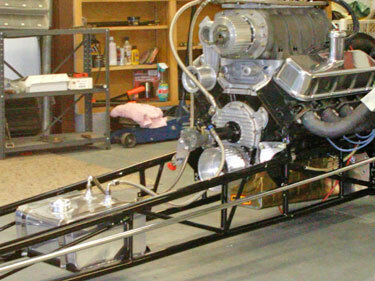 Its a 468 inch big block Chevy with Arias pistons, Howards Cam and Rods, Hilborn 4 port injection (shorty), and 671 blower. Fenstermaker picked it up at the 2002 March Meet and carted back to Georgia. 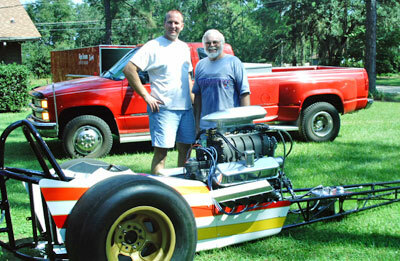 With help from Mark Adams (left), Cody Fenstermaker (right) the big block Chevy fit snugly in its new home. 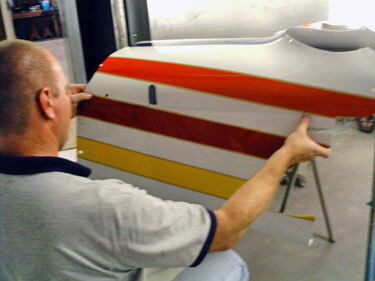 The stripes are laid out over a pearl white finish to match the cars 1970 paint scheme. 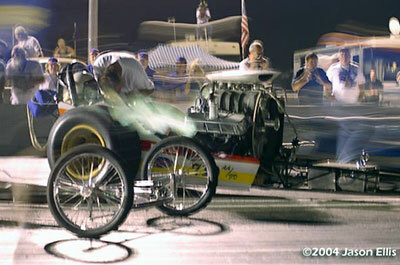 Frank McMillan pulls the tape off after laying out the different colored stripes. 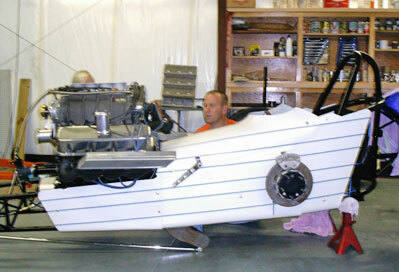 Newly painted body panels are assembled on car. 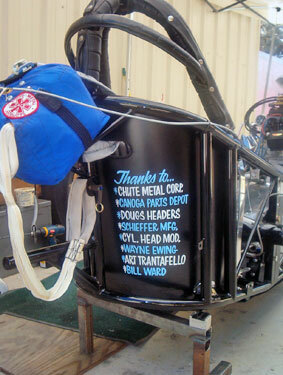 A brand new parachute and pack stitched by Chute Metal Products and newly painted "Thank You" List on the seat which also has original upholstery done by Art Trantefello in 1966. 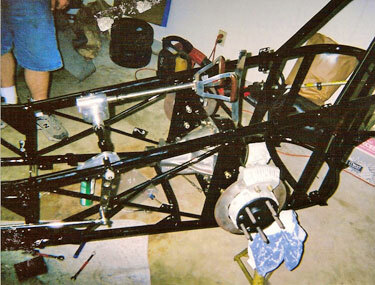 After re-chroming the front axle and other parts were reinstalled on car. 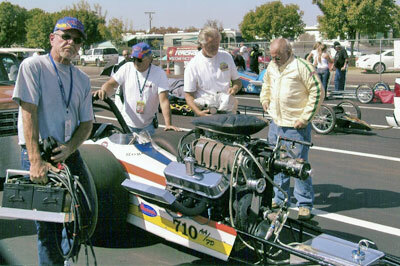 Roger Gates and friends prepare the car for its first fire-up at Roger's shop in Wofford Heights, CA. 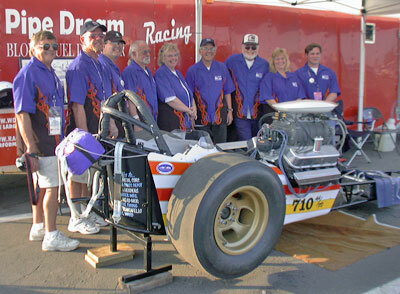 The car made its debut in 2003 at CHRR XII. 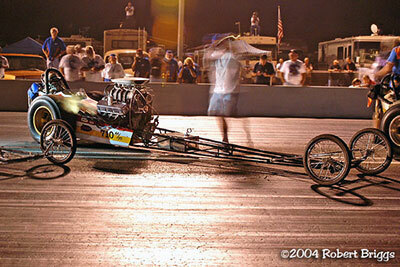 The smiles express the feelings of finishing the car and participating in their first Cacklefest. Big smiles cover a nervous crew as they anticipate the thrill and excitement of the next few minutes. Sitting at the top end waiting to push down for Cacklefest IV. 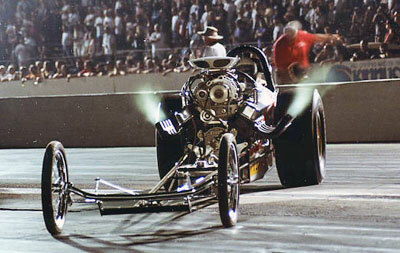 Roger Gates, before thousands of fans, idles the fuel burning Chevy down the fire-up road. Gates in his spot - his mind going back 30 years. 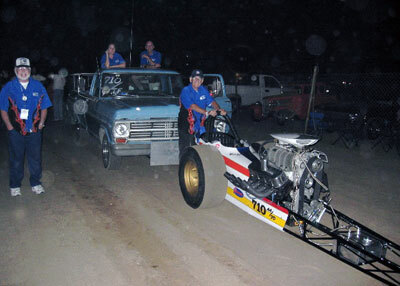 Proud owner, Dennis Fenstermaker gets his ride while the team pushes him back to the pits. 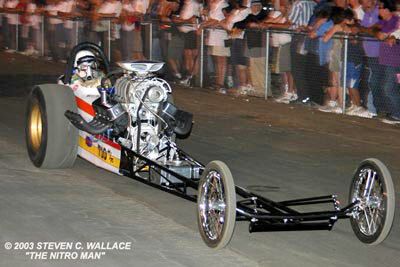 The cars next outing was the 2004 NHRR in Bowling Green, KY. Here is the Fenstermaker family with their Roger Gates car ready to go. 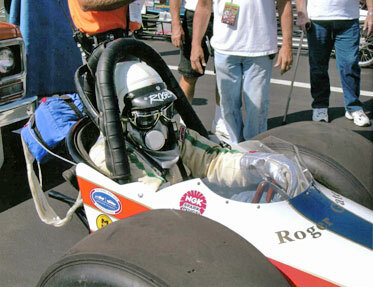 Fenstermaker takes his first seat in the car for a fire-up. 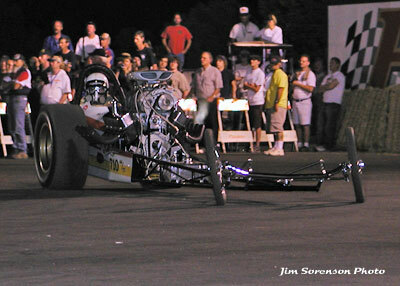 Cody Fenstermaker in the Roger Gates car for his very first Cacklefest at the NHRR II. 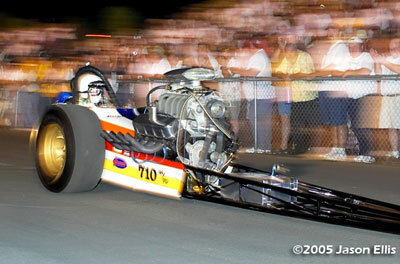 The cars next outing was a trip back to California for the 2004 CHRR. On Friday Gates suits up for a short burnout. 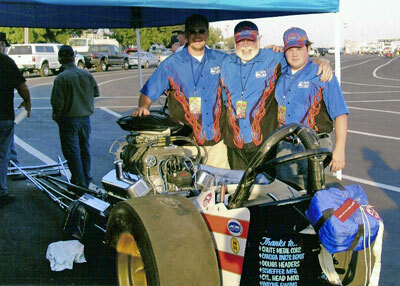 Even cacklecars needs help and this is Fenstermaker's west coast crew. 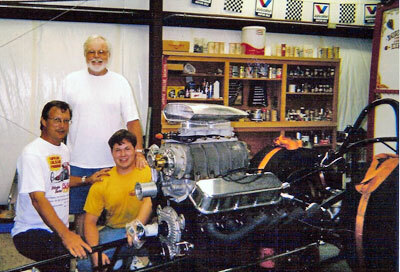 At left brother Gary Fenstermaker, Omer Ethier, John Charlton (exTop Fuel and Funny Car driver), Ken Christy (owner of beautiful push truck & ex gasser owner and driver). 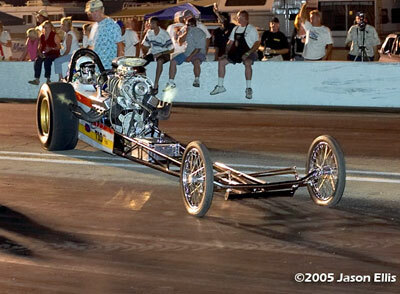 Back again in 2005. Gates waiting to be pushed out for the Cacklefest VI Parade. 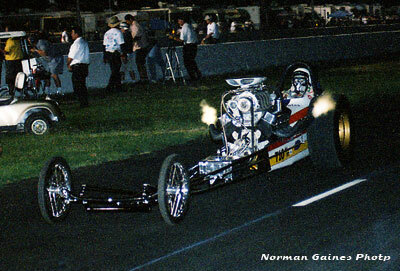 By 2005 Fenstermaker & Gates were Cacklefest vets and always put on a great show. 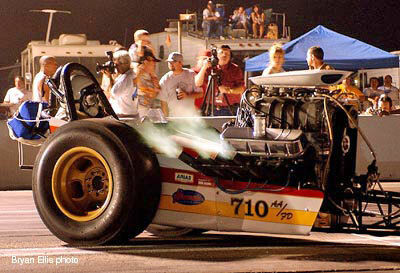 Parting Shot from Dennis Fenstermaker: "The whole reason behind the Cacklefest concept is to preserve the history of our sport and also to thank those who formed the sport and are the true history of drag racing. The second point could not have been more poignant than our very first Cacklefest. 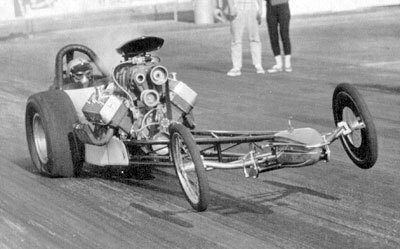 Del Doss, who was partners with Roger Gates in the Ramjet & Doss Racing Team, which taught youngsters to be the future of drag racing. 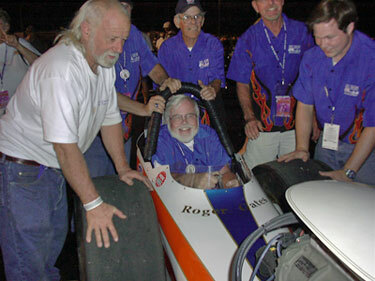 He was the very first person to sit in this car for our first fire-up after its restoration. 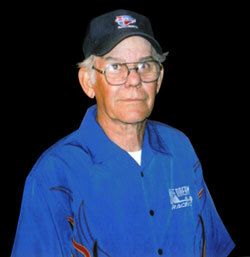 We lost Del on February 1st, 2004. Every time this car is displayed, it is to honor Del Doss. We are "Friends for Life".